Water taken from streams and rivers and pumped from the ground within the nearly quarter-million-square-mile Colorado River basin now meets some or all of the needs of almost 35 million people, including fast-growing cities within the basin such as Las Vegas and Phoenix and St. George, Utah. Some cities, especially in Arizona and Utah, have more than tripled in size since 1990. But more than 70% of the people receiving such water live outside the basin, in cities such as Cheyenne, Denver, and Albuquerque to the east and Salt Lake City, Los Angeles, San Diego, and Tijuana to the west of the basin. From 1990 to 2008, total municipal water deliveries from the Colorado River basin increased by more than 600,000 acre-feet, at a rate much slower than population growth. In fact, the new study shows that if water deliveries had increased at the same rate as population growth, they would have grown by almost two million acre-feet -– assuming that much additional water was even available for delivery. From 1990 to 2008, per capita water delivery rates declined dramatically in Albuquerque (38%); Southern Nevada (31%); Phoenix (30%); and San Diego County (29%). Southern California agencies delivered 4% less water in 2008 than they had in 1990, despite delivering water to almost 3.6 million more people. In fact, 28 water agencies in five different states delivered less water in 2008 than they had in 1990 despite population growth in their service areas, evidence that water deliveries do not simply track population. Municipal deliveries –- which include deliveries to the residential, commercial, industrial, and institutional sectors, but do not include deliveries to agriculture, energy producers, or mining -– comprise about 15% of total Colorado River use (agriculture uses more than 70%). But as the fastest-growing sector, municipal use drives demands for additional water supplies and places pressure on a river system that is over-allocated and facing a supply-demand imbalance, as well as the prospect of long-term declines in run-off due to climate change. 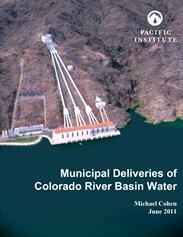 Municipal Deliveries of Colorado River Basin Water shows that projecting future water demands should take into account the successes achieved in cities where there are many examples of water conservation in practice that could be adopted or emulated by the less water efficient providers. The Pacific Institute has also posted the data used for the report, available as a spreadsheet here. Data were generally reported by the agencies themselves. Email crbwater [at] pacinst.org if you have any corrections to the data, or would like any additional information. Download the Municipal Deliveries Report Data (Excel).